Patience is bitter, but it's fruit is sweet! Patience is bitter, but it’s fruit is sweet! 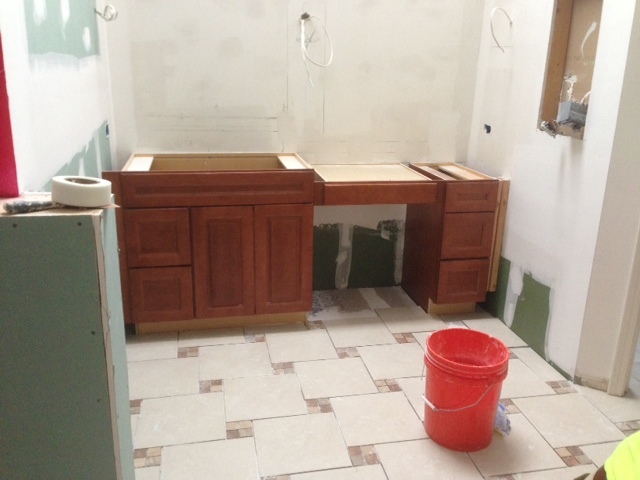 Last week, I gave you an overview of our plans for Jane’s bathroom, a few teaser pictures of the “before”, and I promised you the “after” shots would be coming soon! 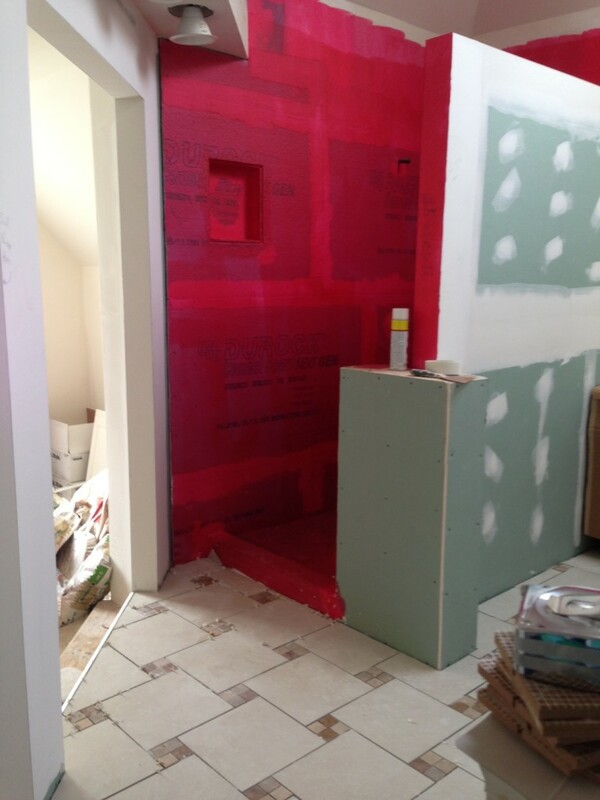 Since I want you to experience the true scale of a renovation, this week’s blog focuses on the during!! This is a true ‘reality post’, because we designers are sometimes expected to create miracles overnight! 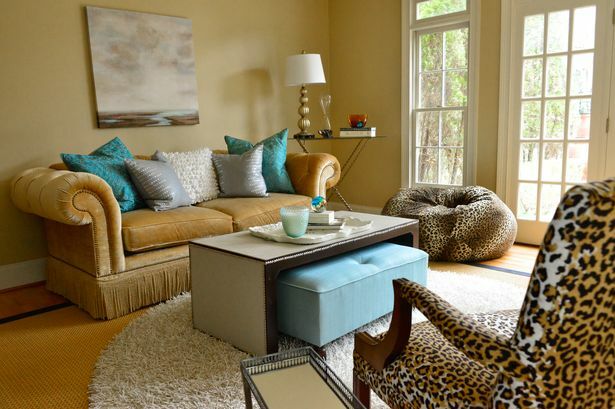 Clients think, we planned it! Let’s get it done now and I’m left to reset their expectations! 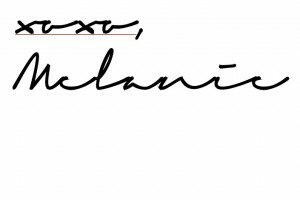 So, my dear readers, this is an exercise for you in patience! Just like Jane, we must wait to see & enjoy the final product! What follows is the nitty-gritty! 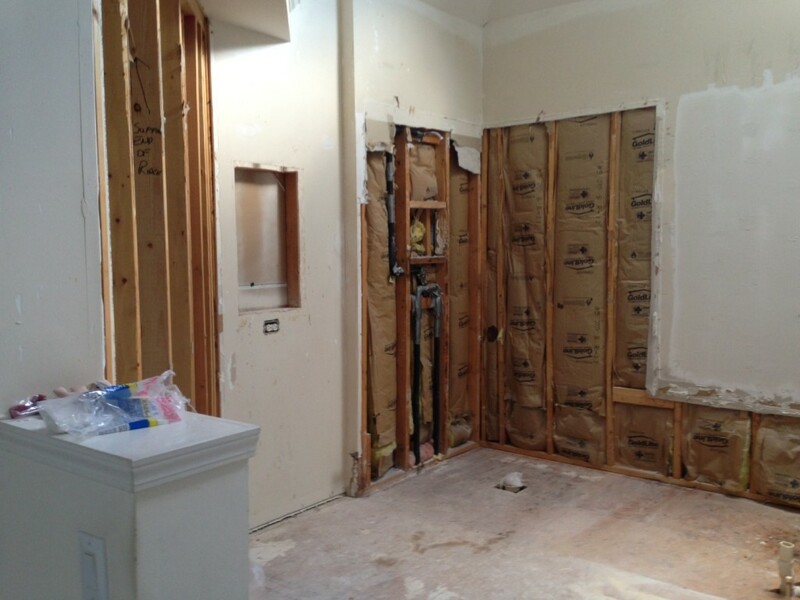 As you recall, our renovation revolves around the tub and shower, specifically by removing the tub, knocking out a wall to the sitting room, and building a bigger shower with lots of space! One concern Jane had was keeping this larger shower clean. When you don’t have a housekeeper and you’re the one doing the cleaning, the design choices will make a big impact on you every day! It’s not an easy job controlling mildew stains along the shower floor, and with this much area, we didn’t want Jane to expend all her elbow grease maintaining this one element. I suggested that we break up the grout lines, and avoid having those long, linear stripes down the shower walls and onto the floor. In this way, the water will have a longer and more difficult road to travel, thus allowing more evaporation time. 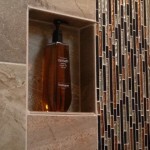 It will also prevent too much water puddling up around the shower edges and the drain. 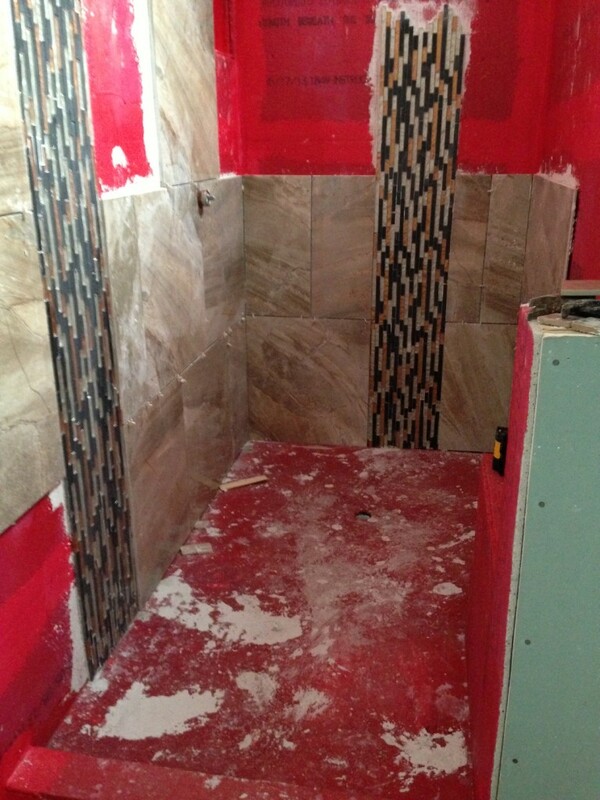 We used a brick pattern on the walls and floors, so any length of grout will never be longer than one piece of tile! Since we could not eliminate grout lines completely, we reduced the number and thickness of them by using oversized tiles. 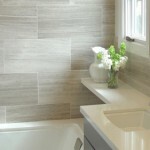 We used Manhattan Stone tile, which is a generous 22″ X 22″ that looks like stone. To break up the long wall, we choose a decorative strip of pencil tiles and installed them vertically rather than horizontally, elongating the wall and creating a “waterfall” effect. Once the wall tile was addressed, we faced another dilemma where we had to use good sense when meshing our design dreams with reality! 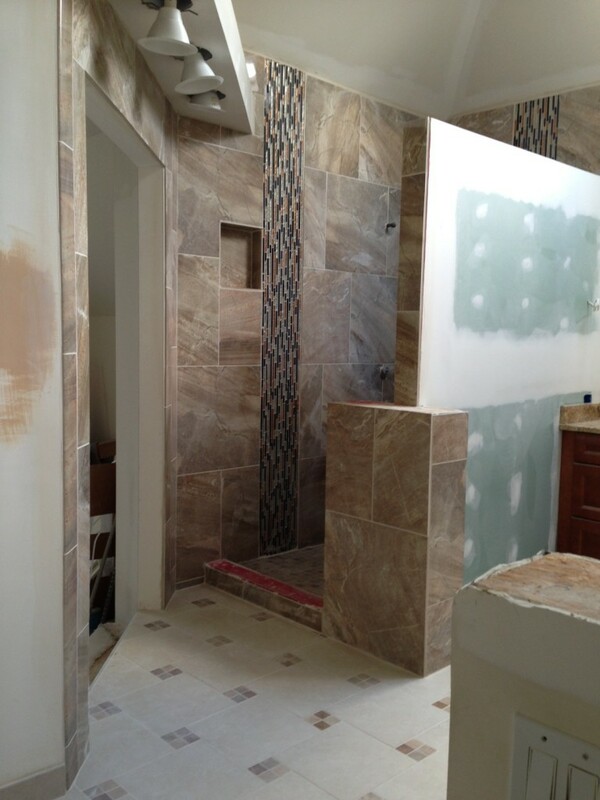 The contractor suggested that we use a shower pan/receptor on the shower floor, instead of tile. 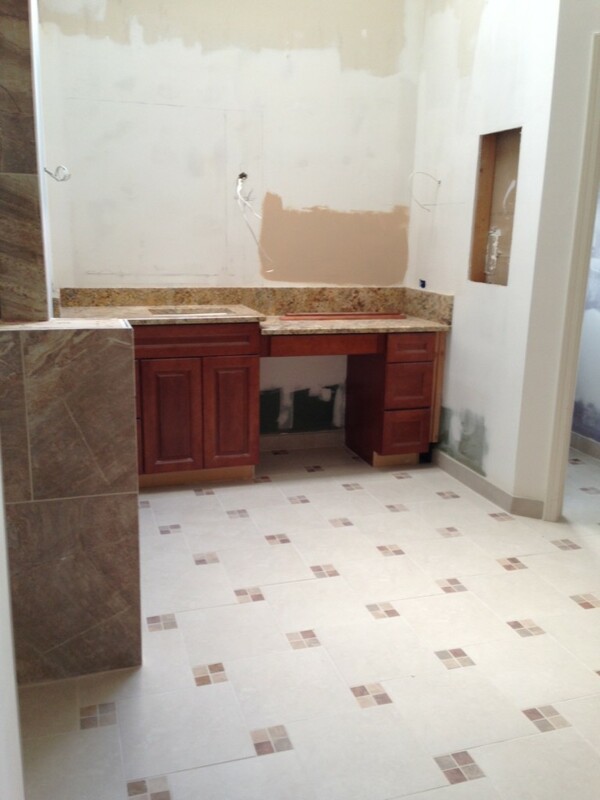 Of course, Jane and I loved the look of the tile, but the contractor wanted to be able to guarantee his work – no leaks guaranteed! 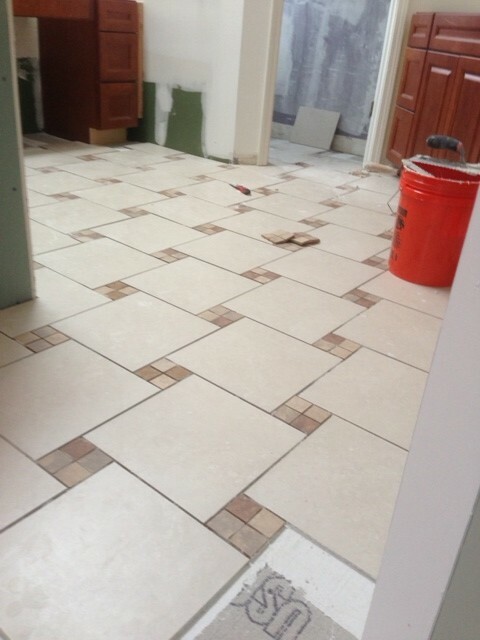 If not done correctly, tile can begin to flex underfoot overtime, becoming prone to eventual failure. This failure can mean replacing the entire floor or even renovating the rest of the house from a major leak! We took heed and found a solution via a raised shower floor. 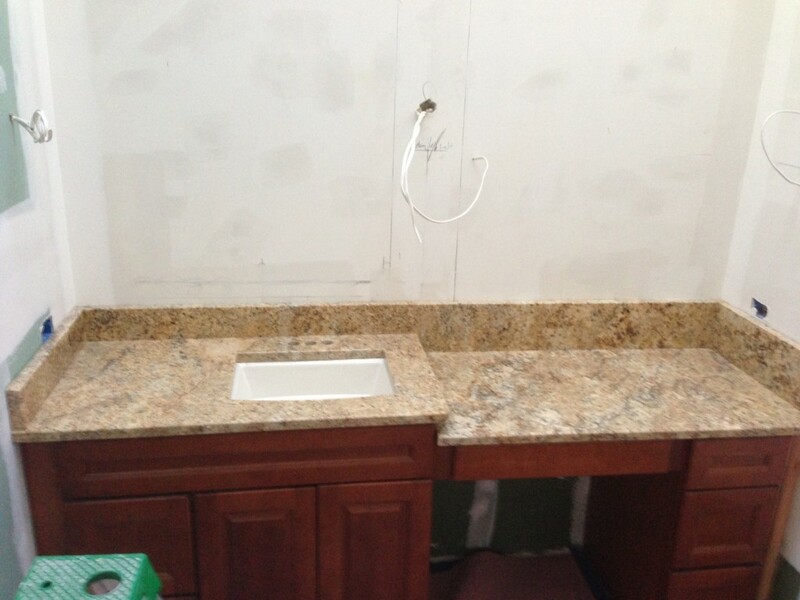 By rising up the floor, we created a watertight basin with water resistant cement board. Next, we painting the whole area with a rubber-like sealant called Red Guard. As you can see from the pictures below, the name is very appropriate! 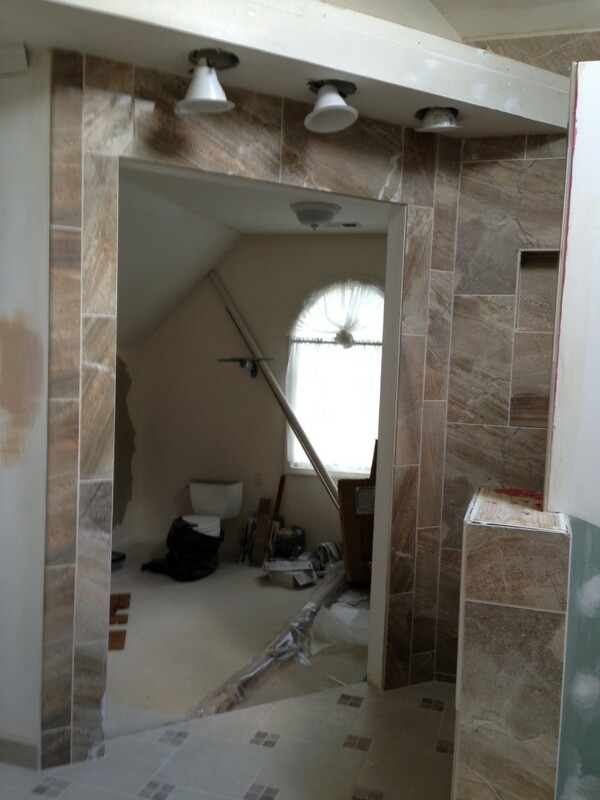 Since the Manhattan Stone was so large, the tiler had to build the shower walls in stages. The sheer weight of the tiles could collapse the grout line if not given ample drying time. Our installation took place over 3 days, 2 rows at a time. Once the first 2 rows dried, we proceeded with the next 2 rows, and so on. Patience is crucial! On the main bath floor, Jane wanted to use the same the tile as the shower floor. 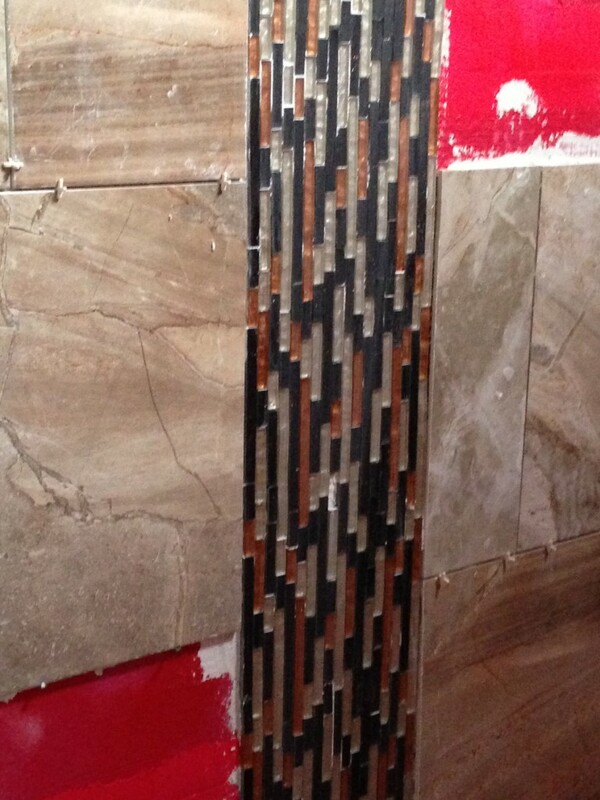 This staggered design breaks up the grout lines and pulls in the smaller mosaic tile. When designing the countertops, we needed to take into consideration Jane’s desire to have a knee covered area, or a vanity drawer. This design element drops the level of the countertop, so what to do with lining up the wall tile? We kept the grout lines straight across, even though it was deeper on one side. The straight line was important because of the dual mirrors planned for that wall. Besides, with hot curling irons and hair dryers, a little more granite is a good thing. 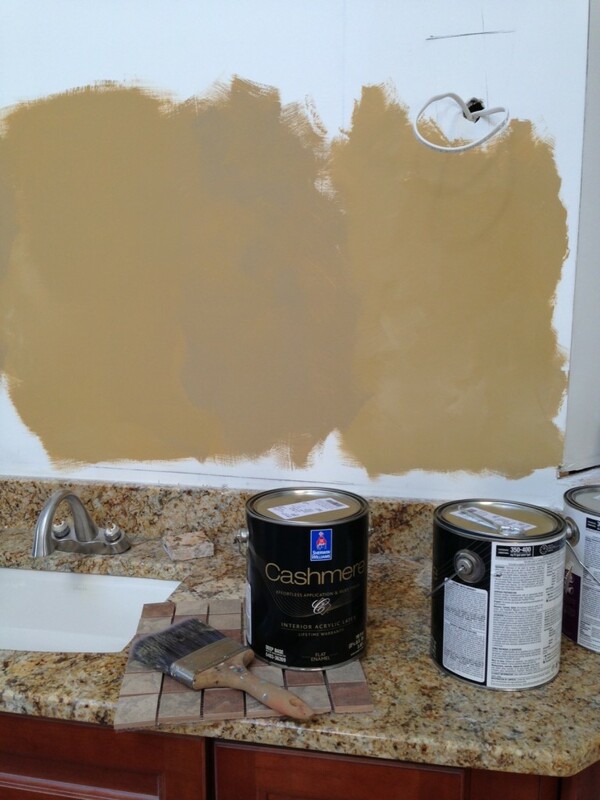 Jane decided not to do the Venetian Plaster, but still use the Tuscan Tan color in a Sherwin Williams Cashmere flat finish. She painted a quick swatch to see how it looked, and we both had one of those sinking moments. It didn’t work! 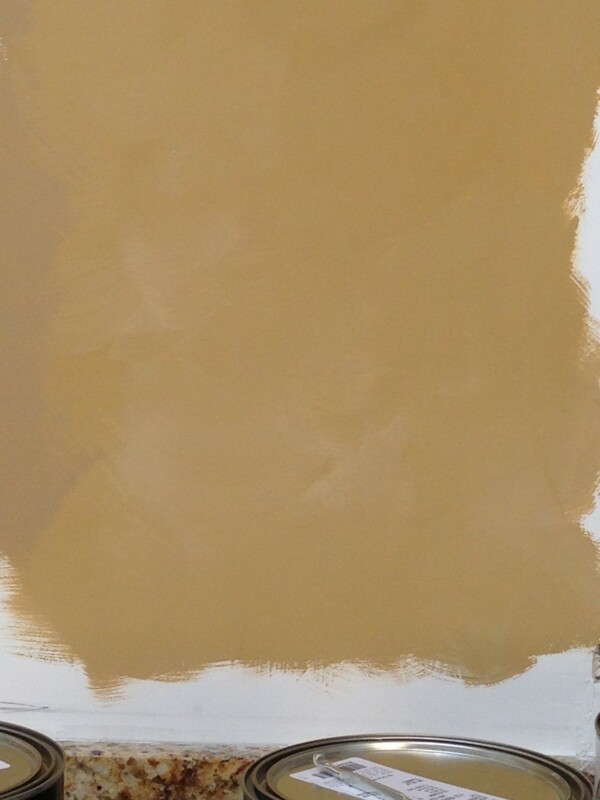 The bedroom and adjoining office had already been painted Balanced Beige, Accessible Beige and Tony Taupe. 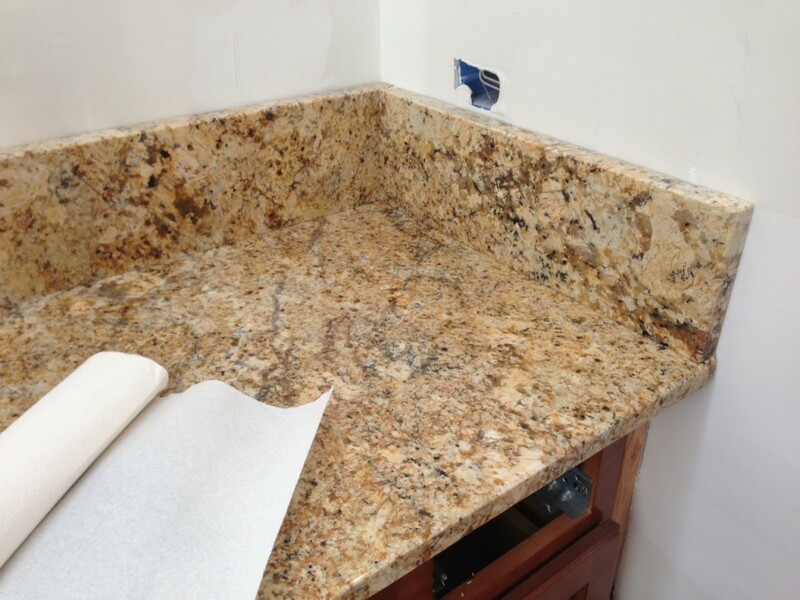 This deep Tuscan gold now seemed to come out of nowhere; it clashed against the cinnamon cabinets and did nothing to enhance the Manhattan Stone. We pulled out our handy-dandy fan deck and decided on Tawny Tan. The warmth of the color came from a touch of cinnamon, but it was still light enough to compliment the granite and the tiles. Crisis averted! 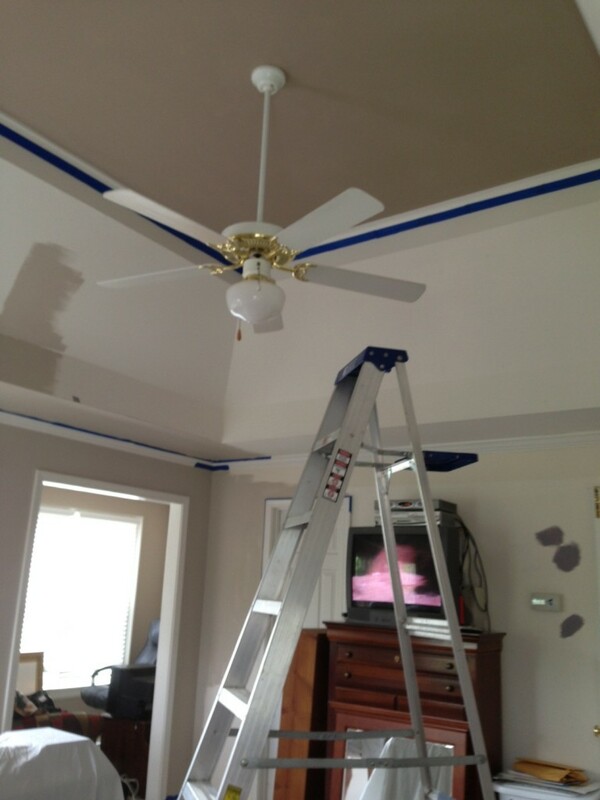 Let the painting begin! As with the shower floor, we had to be flexible and patient. As we all know, the ‘best laid plans of mice and men often go astray.’ There will always be little surprises and setbacks during renovations. Expect it, and you will not miss a beat! Next week, I will present the “after” project! 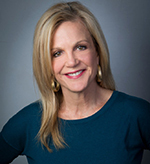 I’t’s so exciting and I can’t wait to share it with you! From 80’s to Awesome! 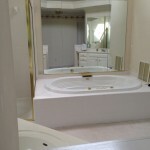 The Master Bath is Complete! 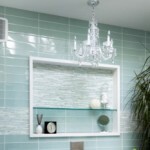 New Trends in Bathroom Tiles!